There are countless more. They speak for themselves. 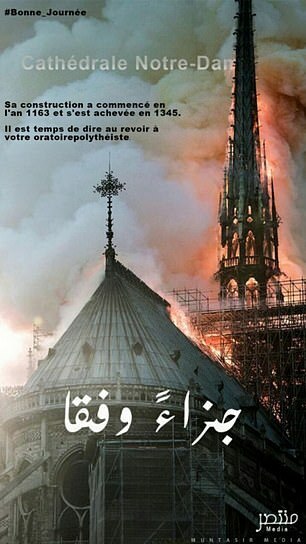 ISIS fanatics are heartlessly revelling in the inferno at Notre Dame Cathedral just days before Easter calling it ‘retribution and punishment’, according to terror intelligence researchers. The chilling message appeared as firefighters continued their efforts to put out the blaze late on Monday night, which broke out less than a week before Easter and amid Holy Week commemorations. The Al-Munatsir media organisation has shared propaganda rejoicing in terror attacks which have rocked France.